Is vaping safer than traditional smoking? Most studies have shown vaping to be at LEAST 95% healthier than smoking. While long term studies don't yet exist, many medical institutions, such as the UK's Royal College of Physicians, have begun recommending vaping as a safer alternative to smoking. CLICK HERE - Royal College of Physicians article suggesting that e-cigarettes should be WIDELY promoted as a substitute for smoking. Does e-liquid contain chemicals that are in anti-freeze? Propylene glycol, a chemical used in e-liquids, has many other uses. It is used in fog machines, asthma inhalers, and even anti-freeze. The reason that anti-freeze contains the chemical however, is actually to make it SAFER for consumers. PG allows anti-freeze to still maintain its function, without being tremendously toxic to consumers. So while e-liquids do contain this chemical, it is a USP food grade chemical, which is safe for consumption. Popcorn lung is a disease that was discovered after a worker at a popcorn factory breathed a buttery chemical (Diacetyl) contained in microwave popcorn, over a period of many years. One of those same chemicals was used in the early days of the vaping industry to make e-liquids. That chemical has since been removed from most, if not ALL, e-liquids on the market. At Unreal Vapors, we do not use Diacetyl in any of our liquids, nor do we purchase any additional premium brands to sell if they contain it. There has not been a single case of popcorn lung attributed to vaping and less than ten total cases have been identified worldwide according to recent numbers. Vapers should feel confident that popcorn lung is only a scare tactic in the media and will likely NEVER result from vaping. Battery - The battery can range from a small (450mah) to very large (4400-5000mah). It can be an internal battery, or some type of standard battery that goes into a device. This is completely dependent on the device. Coil/Atomizer - The coil, or atomizer, is where the device gets its heat from. The power from the battery is transferred through the wire inside the coil or atomizer, which heats up and vaporizes the liquid. 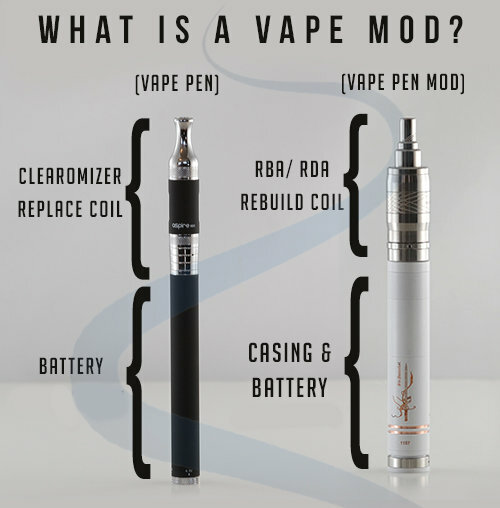 Tank - The tank is where the liquid, e-liquid, or e-juice (all interchangeable names) is stored. Tanks vary in size, shape, and materials. Glass tanks are preferred for flavors that contain cinnamon, menthol, or strong fruits as plastic tanks can crack under these conditions.